Did I find my post Ironman mojo? So it’s been a couple of months and a bit since the big IM. I’ve suffered MASSIVE demotivation and panting afflictions upon ascending the wee-est of hills on my bike or out running. 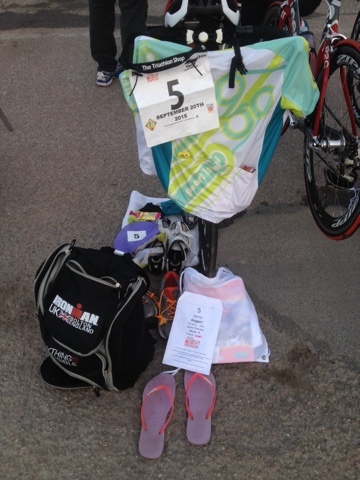 I’ve tried to keep up a bit of running, swimming and cycling, but until yesterday my IRONWOMAN mojo alluded me. Awaiting said mojo to reappear, I diligently shimmied and shaked in summer outfits, unapologetically showing off my new found abs. But as the nights started to draw in, and my muscles got a little bit soft, and the memories of that day dwindled to become another stitch on the colourful tapestry of my life, I started to get a flicker of excitement back in my belly for sporting endeavours. As such, I booked the Dawlish Sprint Distance triathlon, after being invited along by a friend from the Tri club, not really knowing how I’d feel about it. Well as it turned out, the final triathlon of the season was worth the pain of a cramping instep on the run, and standing shivering in a crowd of neoprene whilst we waited over an hour for the morning thick fog to clear enough for sea-faring marshals to be able see swimmers, I’m sure they were being extra cautious after the tragic total disappearance of a man during the sprint swim section of his first triathlon last month. 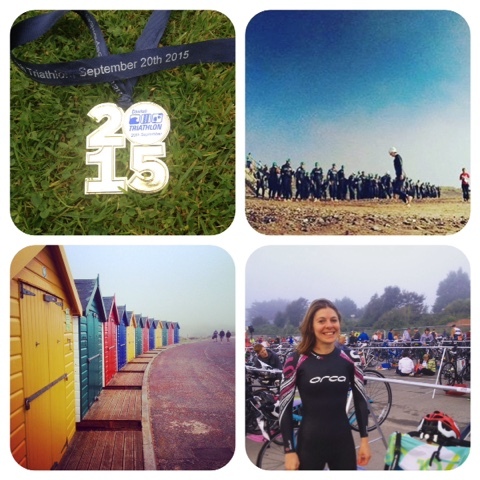 Finishing ironman was a very big ‘first’ for 2015. 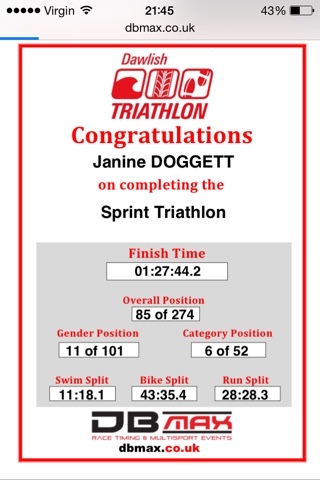 So it was pretty cool to get another unexpected ‘first’ in the shape of my first ever sea swim in a triathlon yesterday. I didn’t really think about what was in store, yet somewhere lingering in my grey cells there was a memory not easy to shake from my first ever open water race in 2013 when I’d climbed into a rescue boat. The race in question was the ‘Big Swim’ on the North Cornwall coast, a 1 mile swim from beach to beach. I was a pretty good swimmer, but having never had any open water training I panicked somewhat at the start. Unbeknownst to me at the time, that feeling can (usually will) appear even when you’ve had loads of experience, and the trick is to over-ride it, rather than to heed its over-protective-parent style warning. At Ironman Bolton, that panic didn’t appear. I was just so excited and relieved to finally be doing it. I’d had all of this pent up energy in the preceding days, so when the race finally started, I could just focus on doing it and enjoy every second. I guess I also knew that I owed it to myself to enjoy it, all of those hours and hours in the pool and 5.20am alarms durung the winter months, all for this 1hr and 19 minutes amid thousands of blue swimming caps. Yesterday the panic did arrive however – in good measure no less at the start of the swim. But overall it felt exciting rather than terrifying. And I breathed my way through it. We started on the beach and ran into the water after hearing ‘3-2-1… Go!’ I was surrounded by a lot of men (and plenty of women for once!) thrashing around trying to get ahead, trying to find some rhythm and space in the sea. 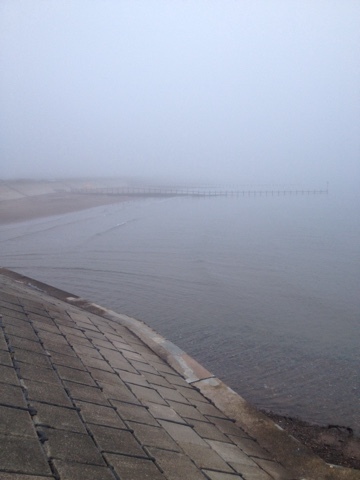 The mist was still so thick that we couldn’t see the yellow buoys. All I could do was to follow the person in front. I focused on getting a rhythm rather than on speed, I tried to go fast but I was held back by all of the people around me, I kept having to swim between two people in the tightest spaces, breathing every stroke to constantly sight around me to avoid getting whacked in the face. And as usual in a feeding frenzy whirlpool swim start situation, it’s a bit dog eat dog, and so I had to do what was necessary to keep myself in a space and not swum over. This involves making people aware that I’m there by swimming with purpose. It got really crowded around the buoys, and some people were breast-stroking. I kept the crawl for the entire race which was great, and I could see some marine life floating around, the sand on the bottom as we neared the shore, and a bright sunshine gleaming into my goggles. I was out in a pretty good time I think, I was super puffed as I ran toward my bike, I had a stich on both sides of my abdomen! Ouch. I ignored this telling myself that it would pass and went in for a super fast transition, getting my bike out ahead of the guy next to me who would go on to finish first in his category. It was so lush to be back on my bike again! It’s been ages since I’ve ridden it. I clipped in and got comfy, and headed out quite quickly. There was a bit of cat and mouse with a bunch of girls at the beginning for a while, and I eventually fell behind them, imaging a race commentary in my head ‘she’s been dropped from the pack!’ But after a strong hill out of the saddle and a focused descent, I passed each girl in this little group and had dropped them much to my sweaty delight. Turning at the half way point I could see that there was now some good space between me and the girls in my category. And then I started to take on the men. I was keeping a great pace, and I was loving it. I gritted my teeth, thought of Chrissie Wellington and got to work. It felt like I must have been one of the first of the women off the bike. It’s just a shame I couldn’t keep the pace on the run. T2 was another quick one, jersey off, socks on, trainers on, grab a Powerbar strawberry gel and off I went, changing my watch settings to ‘run’ as I ran out. My feet felt really numb and it wasn’t long before I had a crampy feeling in my left instep. I started the run strong at 7min/mile. Still felt good at 7.30min/mile and then lost it. I got passed by the first woman at 1km, and my foot and neck (old whiplash) were hurting a lot. I got passed a few times on the run, and to be honest I had settled in to run as comfortably as I could on the threshold rather than absolutely beasting myself – mentally I just wasn’t in that space, Chrissie Wellington thoughts were left behind at T2. I really enjoyed the final sprint, and I eventually finished 6th in my category out of 52. I was 11th out of 101 women and about a third down the entire mixed field, so all in all a result I’m really pleased with. 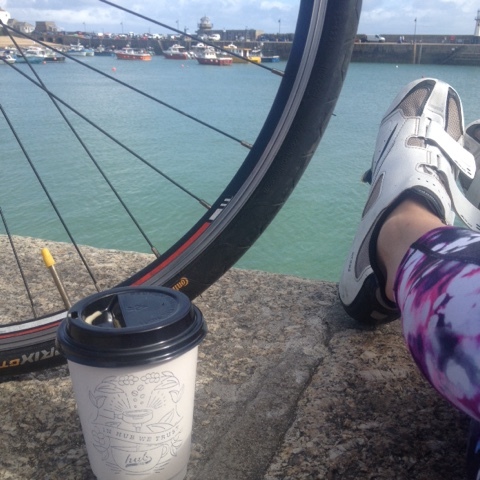 Anna Hughes: Eat, Sleep, Cycle.